The symptoms of asthma and best treatment for your child or you may be quite different than for someone else with asthma, as per the leading experts in asthma. 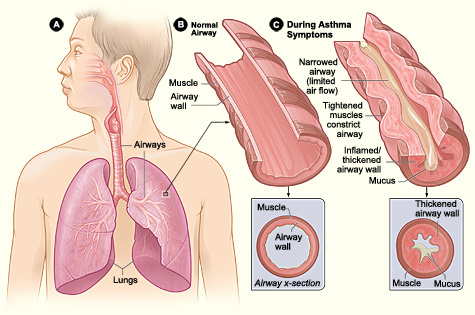 Asthma attacks or asthma flare-ups also called asthma symptoms are usually caused by exposure to allergens such as dust mites, pet dander, mold or pollen. Changes in weather or cold air, smoke or pollution are some of the non-allergic triggers. The symptoms of asthma may be worse or during times of high stress or when you have a cold or during exercise. Children with asthma may replicate similar symptoms as adults having asthma: shortness of breath, wheezing and coughing. In few children the only symptom may be chronic cough. • Coughing that is made worse by viral infections or constant coughing, happens your child is triggered by cold air exercise or while your child is asleep. By performing breathing tests to measure how well your lungs work and by taking a thorough medical history, an allergist diagnoses asthma. Spirometry is one of the tests. To measure the speed of the air you inhale or exhale and to measure the amount of air your lungs can hold, you will take a deep breath and blow into a sensor. This test helps to diagnose the severity of asthma and helps to measure and evaluate how well the treatment is working on the individual. Many individuals with asthma also have allergies, so your physician may do an allergy testing. Asthma symptoms can be avoided by treating the underlying allergic triggers for your asthma.